IMPACT ! IMPACT! IMPACT ! It’s all about impact. If it doesn’t make a difference, there is no point in doing it, is it?? At Aasraa, it’s all about making a difference in children’s lives. A real difference; an opportunity to change life, to care, to guide, to support, to encourage. We take our mission of leveling the playing field very seriously. Every child who crosses the threshold of one of our programs is making a conscious decision to change their life. It is therefore our responsibility to make sure this happens. We have increased the role of computer-aided learning across our programs and have seen the incredible impact this has had on the interest levels of children. This program uses updated computer aided technology as learning methods and combines it with audio-visual and other interactive materials which has only accelerated the rate of learning for these children. Aasraa has seen a significant increase in children’s participation and attendance for this program. 215 children from our Street Smart program are mainstreaming this year! This is phenomenal and we are so proud of our children’s hard work and achievement. We will continue to find children living in marginalized circumstances and empower them with education. We will level this playing field and give them a chance. This is the Aasraa Effect!! Rita,Gopal,Gautam,Kamlesh,Tamana,Chandani, Lokesh and Kamlesh secured an overall grade of A+ respectively and excelled in their year end exams.They passed their exams with flying colours. The children studied in classes from II - V.
We are so proud of all of their hard work and achievement. All these children were part of the 327 children who were mainstreamed through Aasraa's Street to School program. 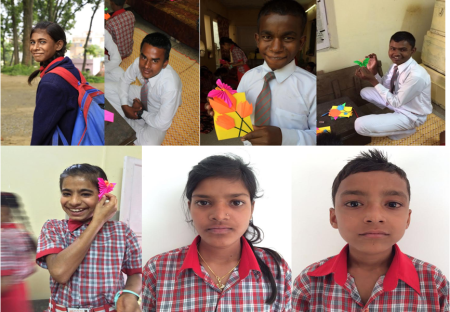 The children study in Shri Guru Ram Rai Public School, Dehradun. Our team at Aasraa believes in finding friends, allies and advocates who share the same ethos as us. Alone, we would not have been able to achieve even half of where we are today, had it not been for our friends. Ms. Tsering from Sakya Hospital has been a great friend and supporter who introduced us to the Council’s General Secretary, Khenpo Rangdol. 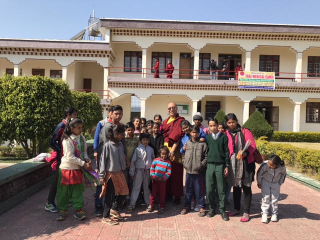 On 14th of February this year, Khenpo invited 40 of our children to a medical camp which was organized by the International Drikung Kagyu Council at their beautiful campus.Doctors from abroad examined all children. They were also treated to scrumptious snacks.The children absolutely loved this day and the smiles on their’s faces said it all. Our sincere thanks to the revered monks and Ms Tsering for their loving care and concern to our children. We LOVE volunteers.We wouldn’t be exaggerating if we said that volunteers are our greatest resource. 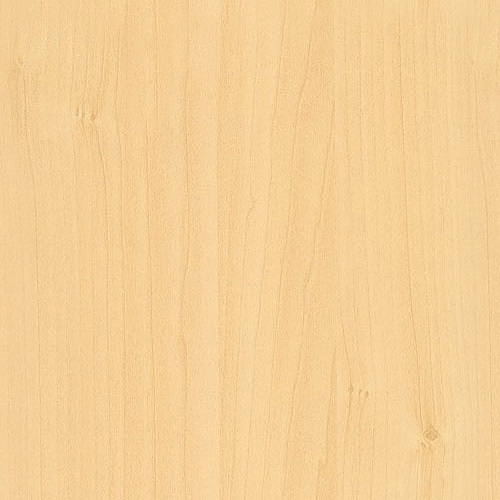 Along with their skills, they bring in fresh perspective, ideas and experiences. The fact that people are willing to dedicate time for the benefit of their community along with themselves is a valuable resource in itself. We have had several volunteers in the past three months, all of who have contributed to our work in their own ways. A group of interns from Symbiosis Institute of Media and Communications (SIMC), Pune shared their feedback on redesigning the Aasraa Logo, Brochure and Project Book (which we will be launching soon). They also made a short film on drug addiction which is so common to be found in children from the street and slums. We also hosted a team from Asian Paints who volunteered with us for a month as part of their CSR programme. The team interacted with the children at Unnayan Shiksha Kendra and ISBT and the children loved it. Asian Paints also donated two Smart TVs and is now going to look at setting up a Painter’s Certification Course for our young adults who may not be capable of higher education. 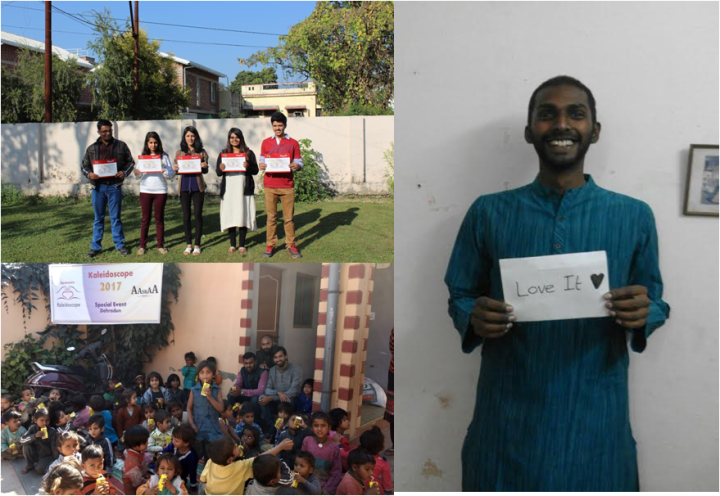 Another group of volunteers from Graphic Era Institute of Technology, Dehradun and University of Petroleum and Energy Studies, Dehradun worked on a survey that dealt with the populace that Aasraa serves. With guidance from our staff, these students designed the survey, implemented it and are now in the process of analyzing the findings. We are confident that the survey results would help us immensely in understanding the impact of our work, our perception in the community and identification of gaps (if any). Some of the insights gathered have already helped us improve our current data collection mechanism. Gavin, from the University of Ottawa, Canada also volunteered with us for a month. He not just worked with the outreach team but also taught English and Science to senior boys. We would also like to thank Mrs. Saxena and Mrs. Badoni, both of who are amazing teachers. They have been volunteering with us for a long time now. The experience and work ethics they bring on board, not just helped our children but also inspired our teachers. 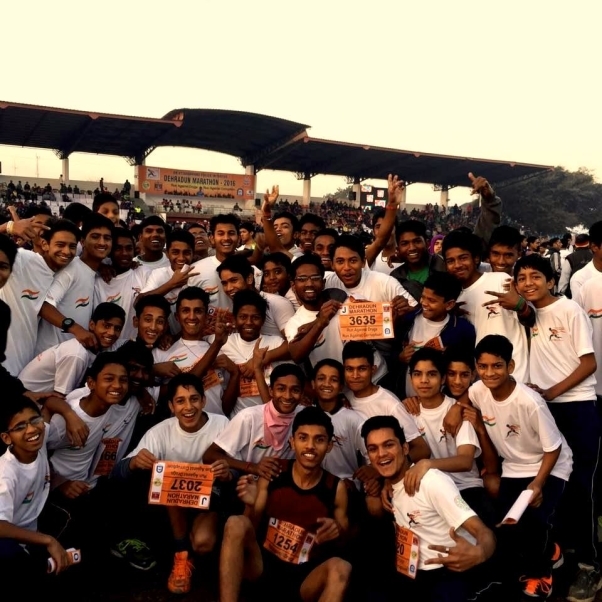 47 students from Aasraa Trust participated in the Dehradun Marathon organized by the Uttarakhand Police, in partnership with ONGC and SIDCUL Uttarakhand. We were honored to be part of this iconic event, which saw people of all ages coming forward to pledge towards a movement against drugs and corruption. We wish to thank Ashok Kumar IPS Tripti Bhatt and Nivedita Kukreti for giving us a special mention and acknowledging our work in the education and rehabilitation of slum and street children. The highlight of this event was our little boy Rahul’s speech. In a short yet powerful discourse, Rahul drew people's attention to the perils of drugs and how supporting child begging directly promotes drug use. He made everyone pledge "Bhiksha Nahi, Shiksha De!" and left everyone in awe of him. We are so proud of Rahul and all our students who participated in the Marathon in different categories. We would like to say thank you to all our friends and well wishers for their constant support and encouragement.